Court Aims to Help Vets with Legal Troubles A new court in Buffalo is working with the Veterans Affairs Department to help veterans such as Gary Pettingill, who was busted in a drug sweep, get back on their feet. Court officials hope that reaching out to troubled veterans will help reduce the risk of suicide or violence. 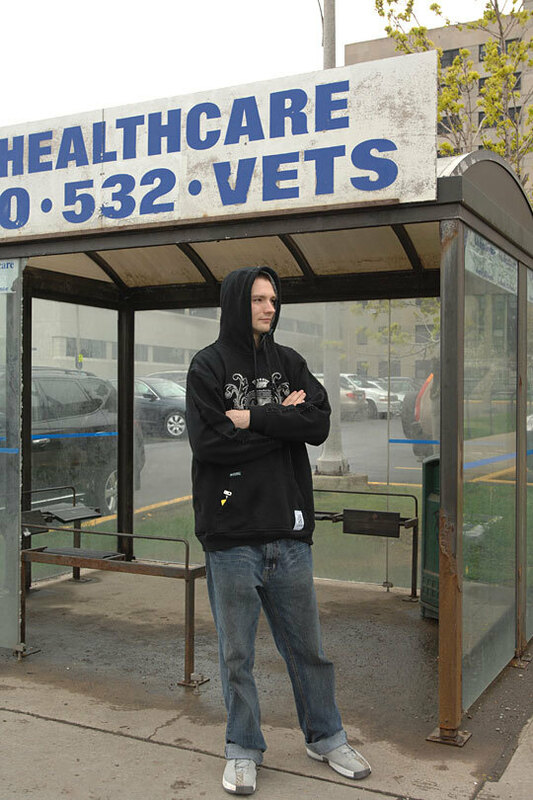 Iraq veteran Gary Pettengill waits at the bus stop outside the Veterans Affairs Medical Center in Buffalo. He is here most days, either to work or to go to drug rehab. 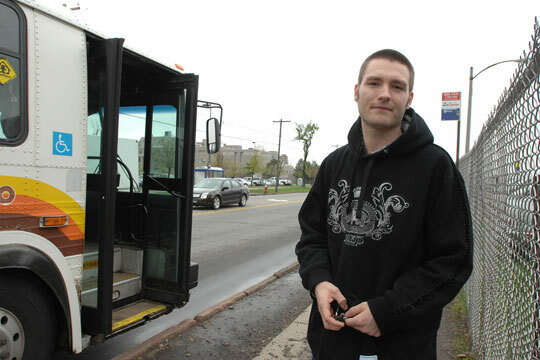 The VA provides Pettengill with bus tokens to get to and from the medical center. That helps him stay on track with the Buffalo veterans court. As the wars in Iraq and Afghanistan put renewed focus on the issue of veterans' mental health, a judge in Buffalo, N.Y., has created a special court to assist veterans who wind up in the criminal justice system. Gary Pettengill wanted to make a career out of the military, but the Army made him take a medical discharge in 2006 after he injured his back in Iraq. At the time, Pettengill was 23 and married, with a third child on the way. To cope with what he says were empty days and nightmares caused by post-traumatic stress disorder, Pettengill says he started smoking marijuana. Then he began selling it to pay his bills. In February, he was arrested during a drug sweep and accused of being in possession of two pounds of marijuana. Pettengill found himself facing serious time and the possibility of losing his children to the child welfare system. His family was evicted from their apartment. Then he was referred to Judge Robert Russell's "veterans court." On a recent Tuesday, Pettengill was one of about 20 veterans sitting quietly in the courtroom waiting to be called before Judge Russell. Along one wall is a line of volunteers — mostly veterans but a few active duty officers — who are waiting to be assigned as mentors. Pettengill, sporting a buzz cut and wearing a clean plaid shirt so big it looked like he might disappear in it, was called before the judge. Russell greeted him and then asked for an update on his life. "My family and I moved into a new home ... it's pretty nice. Different neighborhood. More room for the kids to play inside," Pettengill told the judge. Since Pettengill was arrested, the veterans court — working in conjunction with the Veterans Affairs Department — has helped him get drug counseling as well as part-time work, cash and help in finding a new apartment. He also has been assigned one of the volunteer veteran mentors. Russell and his staff started a docket for veterans in January when they realized increasing numbers of them were showing up in court. They counted 300 veterans who came into the local courts last year. "The reality is, we knew we had to do something now ... because soon we're going to have 400,000 coming home," says Hank Pirowski, who heads Judge Russell's staff. 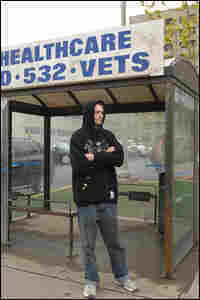 He says a lot of the veterans they've seen got into trouble because they were dealing with the aftermath of combat. "It starts out simply from a prescription abuse, to illicit substances, to some type of crime activity to support that [drug] activity, to being arrested, to going to jail," says Pirowski. The court, he says, is Buffalo's way of trying to do right by veterans while also trying to prevent incidents of suicide or violence. Hank Pirowski says he and Russell have thought a lot about the stories of Iraq veterans who came home and then killed themselves — or other people. "If we would have reached that person sooner, would they have gotten to this point and to that charge?" Pirowski asks? "That's a good question. There's a chance we could have." Pettengill says he was headed for suicide before he wound up in Judge Russell's court. "I was having nightmares and I couldn't sleep," he says. "I wanted to do anything to rest. Anything." Pettengill says he turned to drugs to fill a void that opened up when he left the Army. He hopes the court will help him stay on track. "I have three beautiful children who need their father, and they don't need a suicide hanging over their heads for the rest of their lives either," he says. Other veterans, such as Darryl Harper, say they're grateful for Judge Russell and his new court. Harper learned Arabic from a babysitter while growing up in Buffalo. Air Force intelligence put him on the front lines in Lebanon after a Marine barracks was bombed in Beirut in 1983. He says he's dealt with manic depression for years. Last year, it got the best of Harper and he turned on the oven in his house to kill himself. He survived, but he was charged with attempted arson. Now he's on probation, and Russell has ordered him to stay on his medication and see a counselor. Harper's son was killed a few months ago during a robbery, and Russell's staff has kept a very close eye on him. And Harper is glad for that attention and direction. "This is how I look at it: He's my general, who has ordered me to do these things," Harper says.